The National Family Preservation Network (NFPN) is pleased to release today a comprehensive research study that includes family assessment, engagement, exit instruments, and factors that are specifically associated with successful reunification. First NFPN research study that included all three initiatives of family preservation, reunification, and father-involvement. First time the NCFAS-G assessment tool has been tested in a research study with both front-end prevention services (differential response) and placement prevention services. First time that exit instruments have been designed and tested to align questions for the worker and parent(s) which also correspond to the NCFAS assessment tools. Substantial progress by both intact and reunifying families between intake and case closure. Improvements on all 10 domains of the NCFAS tools were statistically significant. 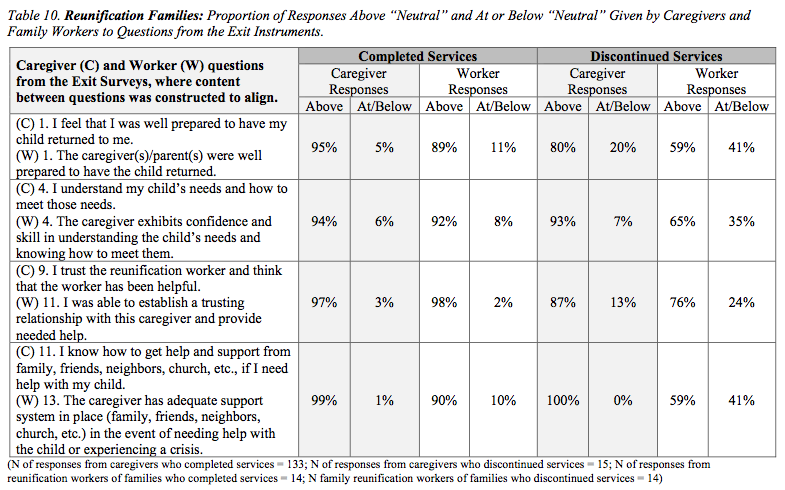 For families completing services, there is close alignment between worker and caregiver on responses for both intact and reunifying families.The only exception was the caregiver’s perception of insufficient quantity of concrete services for reunification. This research supports previous findings that intensive services are effective with a broad variety of families including those families with presenting problems that are considered high barriers to successful reunification such as substance abuse, mental illness, and domestic violence. Of the services that workers provided to reunifying families, three stand out as having a post-intervention effect. Thus, at three months post-reunification services, families that had received concrete services, step-down services, and father-engagement services were more likely to remain together than the families that had not received these services. NFPN is offering the Exit Instruments at a low one-time price for any agency that is interested in using them. You can order and pay online for the instruments at the link below. Note that the instruments are included at free with any new purchase or upgrade of the NCFAS-G or NCFAS-G+R assessment tools.